Tungsten hairpin filaments are the standard type filaments widely used in Scanning Electron Microscopes, Transmission Electron Microscopes and Microprobe systems. Tungsten filaments are also called cathodes or electron emitters or electron sources. The high quality filaments we offer are made to the original equipment manufacturer's specifications using special tools to guarantee the correct shape for the filaments and to generate the optimum electron beam. The filaments are annealed in vacuum, stress-free and precisely aligned before they are shipped. Please consult the list below for the correct type of filament for your SEM, TEM, or EPMA. 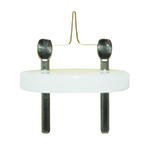 The tungsten filaments are manufactured from high grade tungsten. Of all metals in pure form, tungsten has the highest melting point (3422°C / 6192°F), the lowest vapor pressure at temperatures above 1650°C (3000°F) and has the highest tensile strength. Tungsten also has the lowest coefficient of thermal expansion of any pure metal. This combination of properties makes tungsten the ideal material. For older systems to enhance resolution/brightness. Ceramic in stainless steel alignment ring. ISI / ABT / Topcon Filaments, 2-prong curved pins. Dimensions for EM Filament Bases (for Tungsten/Lab6) Filaments?